Techonology BIZ TBIZ 2012, during which we were rewarded with the "Special Mention" BUSINESS DEVIL. The excavations reproduced are: Pompeii and the Baths of Caracalla. 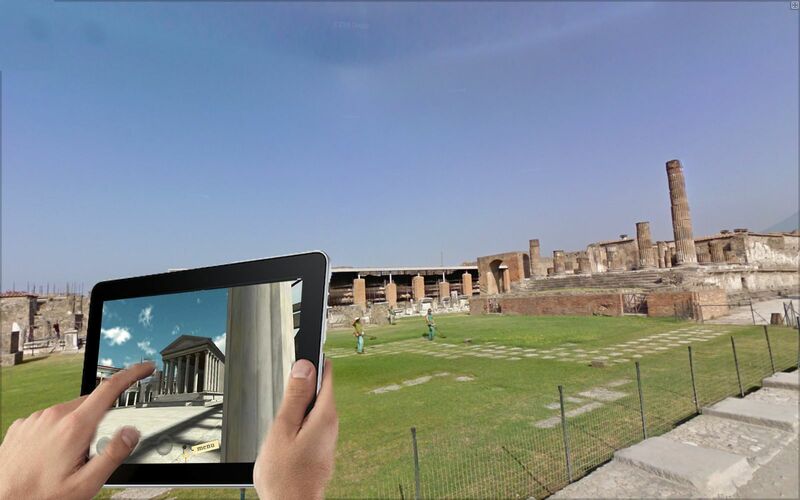 It's under development a very ambitious project: the reconstruction of Pompeii in a 3D environment on mobile devices. The system is designed to increase the perception and enjoyment of the visit to the ruins of Pompeii, making the visit more attractive to visit. For this purpose, Pompeii ill be reconstructed in 3D environments with life scenes of the inhabitants of that time. Thanks to I.M.U. (inertial measurement unit) the application will allow the visitor, framing the area of ​​interest, have a window into the past through which to view the city's reconstruction in real time and have also an aid to navigation along the paths of excavations. Each area (Holes, basilicas, theaters, houses) is accompanied by in-depth audio / video and reported through appropriate warnings and icons on the screen. Three-dimensional reconstruction of the entire archaeological area of Pompeii currently reconstructed. Free navigation at the whole area rebuilt with the possibility of immersion in the 3D reconstruction. Real-time interaction with the surrounding environment including points of interest and / or characters of the place as soldiers, men, women and children from different social backgrounds. Choice of navigation paths divided by theme and / or duration. Information of a textual and photographic audio (in 5 languages) of the major points of interest of the excavations. Thanks to the technical features and functions of the application on the excavations of Pompeii, we developed the reconstruction of the excavations of the Baths of Caracalla, on behalf of the Ministry of Culture.